This attractive Superior Shed was installed in Solihull, in the West Midlands and included delivery and installation as part of our end to end service. The exterior was finished with Georgian windows, to match the windows on our customers house, together with grey slate composite roof tiles. The cladding was coated in Ivory Valtti paint to complement their house. A security pack was also added, together with a workbench for added practicality. Crane Garden Sheds stand out among the variety of wooden sheds available on the market today. Handmade to order in our Norfolk based factory, each custom built shed is made from sustainably sourced FSC® certified Scandinavian Redwood and is delivered and installed by our expert team. 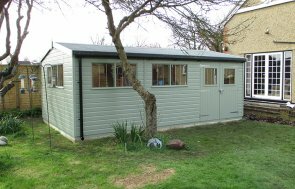 Our Superior Garden Sheds are robust and ideal for secure storage, a hobby room or workshop. 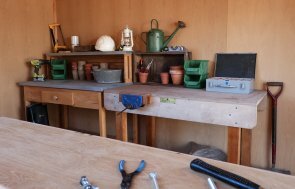 Available in a wide range of sizes, you can have a simple shed, or we can tailor your building to include extra features, such as electrics, lining and insulation, and a security pack. 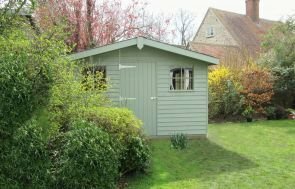 For more information on our sheds, along with a look at the full range of garden buildings we offer such as studios, summerhouses, garages and greenhouses, we encourage you to take a look around our website to find the perfect building for you.